Georgina Richards, 60, passed away June 23, 2011 in Scottsdale, Arizona. Wake services are Thursday, June 30, 2011 at 6 pm at the Lehi Community Center, 1231 E. Oak St., in Mesa, AZ. 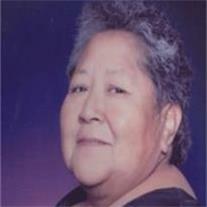 Funeral services are Friday, July 1, 2011 at 8 AM at the Nazarene church, 1428 E. Oak St., also in Mesa. Arrangements by Bunker’s Garden Chapel.